I know there is nothing worse than having a bad night’s sleep. Even if there is no need for you to be up at the crack of dawn and you have a leisurely day ahead of you, lack of sleep affects every aspect of your life. Couple this with having to deal with back or neck pain and it doesn’t make for a very happy you! I know how this feels which is why (after researching and buying my own memory foam mattress) I decided to bring this website to the internet. I also know that you can spend thousands of dollars on a memory foam mattress. You only have to look at brands like Tempur-Pedic to know that. Whilst the big names have a lot to offer, I think it’s only fair that some of the lesser known manufacturers should get a mention for the hard work they’ve put into bringing mattresses to the market that help with various back and neck pains without the need for you to take out financing! One of the mattresses I think deserves a mention is the Red Nomad 10″ Luxury Memory Foam Mattress and in the following few words, I think you’ll agree that this one really could be the answer to replacing your current coil mattress. This memory foam mattress is 10 inches in depth and comprises of a 7 inch high density polyurethane foam base and a 3 inch 2.5lb ventilated memory foam layer. To finish the whole thing off, you have a cover that’s made from bamboo cotton which is washable and helps with ventilation. When this mattress arrives, it’s enclosed in anti-dust mite and hypoallergenic zip off packaging which adds to peace of mind with cleanliness. You will have to let the mattress expand, and this can take anything from 5 to 6 hours. What you will find however, is there is very little in the way of chemical odor while this takes place. In fact, I think the manufacturer deserves a thumbs up in this respect because I could find very few issues with that outgas odor that many people complain about with other brands. Red Nomad has developed this memory foam mattress with chiropractic patients in mind in that it will properly support each pressure point across the body (which can be the cause of those terrible “niggles” you feel throughout the night and the next day). However, whilst I have come across many comments championing this mattress from people who have to see a chiropractor, I would recommend you speak to your doctor if you think this one will do the trick. That aside, comfort is a little bit of give and take. You know, not too salty, not too sweet but just right! This is to say it’s plush but not too plush and firm enough to offer the support you need. It’s also great for those of you that like to sleep on your side or your tummy. In terms of the type of base you put this memory foam mattress on, well, if you’re on the heavier side it might not be a good idea to have a slat type base. This might mean that parts of the mattress will bulge through the bottom. As I say in many of my reviews, be prepared to feel a lot different when you first move from a spring to memory foam mattress. This one is no different so the first couple of nights might be a bit strange for you. The only reason for this is your body is suddenly being supported in places you never thought possible! Of course, this memory foam mattress carries the CertiPUR-US certification which proves it has been tested for low emissions, durability and performance. 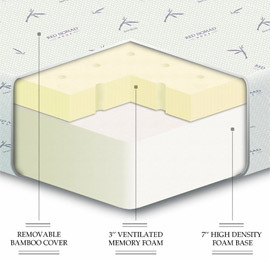 If heat is your issue (a problem many people come across with memory foam mattresses), this one fairs better than most because of the bamboo cotton cover and the premium memory foam that’s been used to construct it. If you’re fed-up with that old spring mattress but you’re loathed to shell out thousands of dollars on a memory foam mattress, I think this is an excellent alternative. If you want to find out more, take a look at Amazon. The last time I looked there were some great discounts on offer and plenty of very happy customers!